The proof is in our workmanship, design, and follow-through. Sol Luna Solar offers a varied experience with a wide portfolio consisting of residential projects and large scale school projects. As installers and project planners Sol Luna Solar has gained a superior reputation for our ability to plan, coordinate, and execute new projects in order to maximize the highest return for our clients. 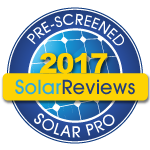 Our Solar Installations Exceed Customer Expectations! Click on the images below to view some of our past projects. Sol Luna Solar offers 40 years of experience and excellent customer service. We are proud to have an A+ rating with the Better Business Bureau and have been recognized as a Best of Santa Fe company in 2015 and 2016. Sol Luna Solar is a CES approved Solar contractor for School and Government projects. In addition, to our competitive pricing, we offer knowledgeable NABCEP certified project leaders, qualified electrical journeymen/contractors and competent crew members for each of our solar projects. Just to prove you are a human, please solve the equation: 24 + 1 = ?